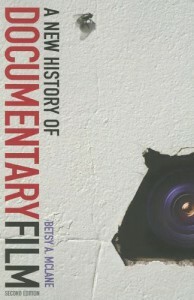 Betsy’s current research project is a 6000 word essay on American Political Documentaries of the 21st Century being included in THE ROUTLEDGE COMPANION TO FILM AND POLITICS is large a volume being edited by Claire Molloy (a Professor in Film at Edge Hill University in Liverpool) and Dr. Yannis Tzioumakis (Lecturer in Media and Communication Studies at University of Liverpool). Section eight (Documentary) continues the international perspective of the previous section exploring different iterations of political documentary. While films at the general entertainment end of the spectrum have been criticised for their political or apolitical stance, documentary has not suffered the same reproach. Indeed, there is a long and complex historical association between politics and documentary filmmaking. Acknowledging this significance, the final section of the collection will be devoted to the relations between documentary and politics in their many forms and guises. A key question that this section will deal with is how documentary manages to negotiate a position between being an agent of social change and a form of entertainment cinema. We publish hundreds of journals and thousands of new books each year, from offices all over the world. Our current publishing program encompasses the liveliest texts and the best in research. Use our navigation menu to browse our products, resources and information in a wide array of subjects and disciplines, with a focus on the humanities and social sciences.